To further CBEC’s mission, sustainable agriculture has arrived. 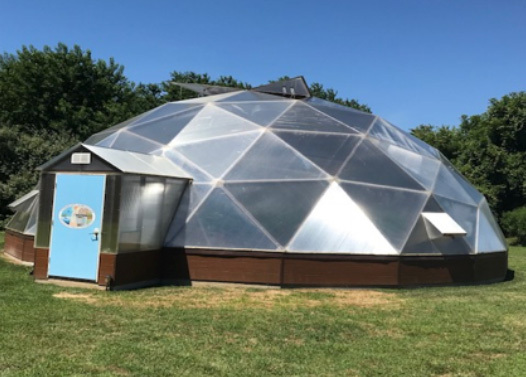 This endeavor started with the creation of a 500 square foot geodesic dome by Ground Air Heat Transfer Technologies, which stands for Ground to Air Transfer system. During construction, large tubes were placed underneath the foundation to collect air, which was blown into the Geodome. This underground air stays at a constant low temperature of 50 degrees, which helps to cool off the Geodome in the summer and heat it up over the winter. This creates a stable geothermal climate for both the fish that help run the aquaponics system and the plants that benefit from them. The aquaponics system is housed inside a 500 square feet geodesic dome, which allows for optimal plant growth. Within CBEC’s geothermal dome, you will notice planter beds and one quite large fish tank that houses 175 Tilapia. Within an aquaponics system, fish act as the powerhouse of the system. Fish waste is collected and filtered, allowing the build up of nutrients that are fed directly to the plants. This is the most important aspect of an aquaponics system. Water-based growing systems do not need a fish farming component, but with increased nutrients from the fish, plants will grow at three times their usual rate and allow for quicker turnover of crops. 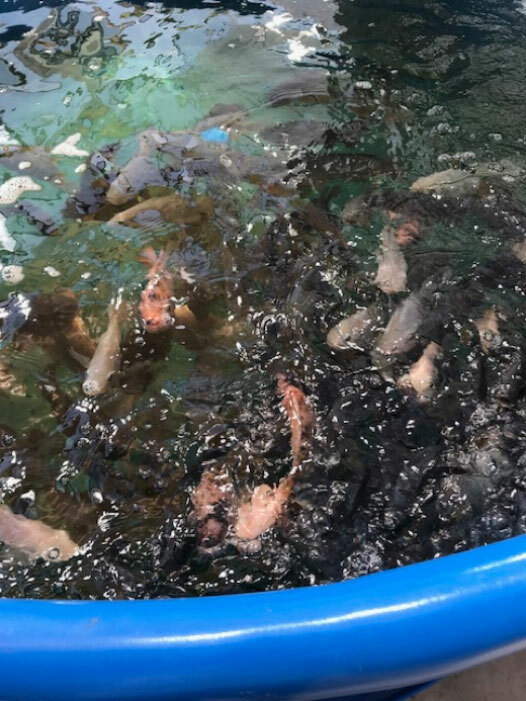 CBEC’s aquaponics system runs off of 175 Tilapia fish that provide nutrients to the water system. Produce can be directly sown into the aquaponics system, but take longer to reach maturity. 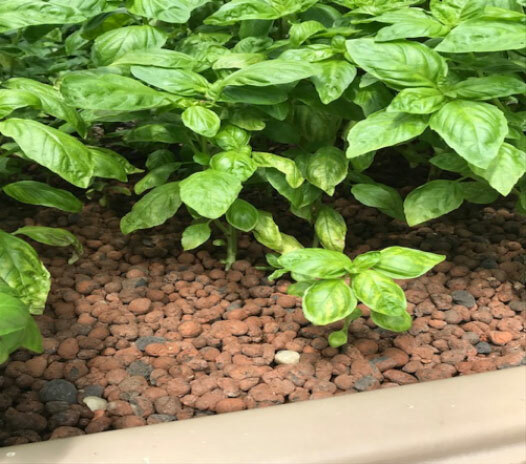 To avoid slow development of crops in the early stages, plants are sown in seed starters that allow them to grow in unison with plants growing in the aquaponics system. Much like an organic farming method, plants are grown in these seed starters so that when they are transferred, they have already developed a root system. This allows them to develop much quicker than if they were directly sown into the system. Plants are first sown in seed starters equipped with UV lamps to increase the rate of growth. This allows for the next rotation of crops to develop faster and be ready for planting in the aquaponics system. 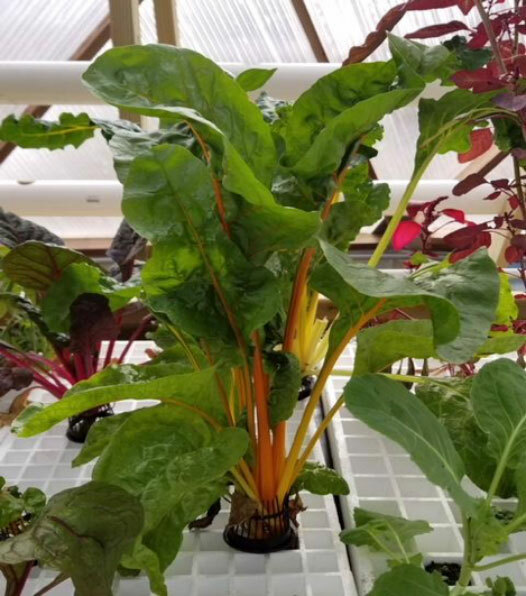 CBEC’s aquaponics system uses two highly contrasting growing techniques. The first method is called Deep Water Culture. Deep Water Culture is the use of floating grids that can be filled with leafy produce. Beneath the surface of these floating grids, root systems have ample room to flourish. The root system is planted directly into the water, which allows for the plants to absorb nutrients from the system and clean the water. 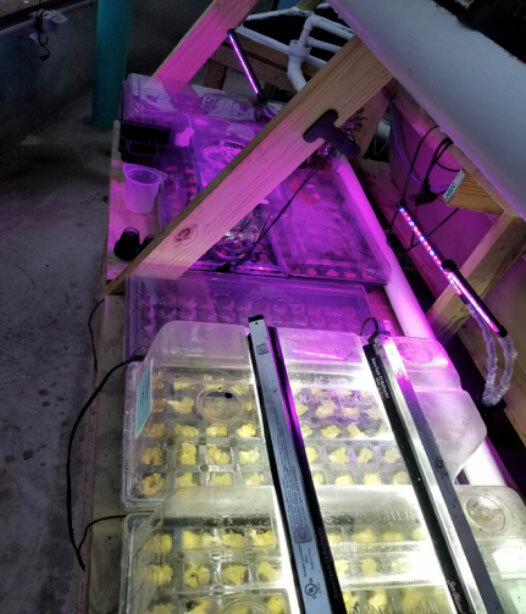 One aquaponics growing technique is Deep Water Culture. Floating planting trays allow a crop to grow directly in the water, leaving room underneath the trays for the root system to expand and soak up nutrients. Media Beds are also used. Media beds are used to grow larger produce that need a medium to support its vertical growth. Pumice rocks are used to emulate the benefits of soil for produce. Each piece of pumice rock has a larger surface area to allow for the collection of microorganisms. An aquaponics system is a closed-loop system. This means that water flows completely through the system, then returns to the start of the loop. This is a good example of sustainable agriculture. Once the fish tanks and beds are filled with water, little water is added relative to traditional farming methods. With public concern increasing over the usage of freshwater, aquaponics allows for insight into more sustainable farming techniques that can conserve natural resources. This is true for the soil as well. Instead of requiring constant care and maintenance of the soil to ensure its productivity, aquaponics systems use no soil in its growing methods. With the combination of Ground Air Heat Transfer technologies, green infrastructure growing methods are on the rise throughout the world thanks to an increased demand for more eco-friendly agricultural methods. Media Beds facilitate vertical growth in plants by creating a strong upright structure. The media pebbles act as soil by developing microorganisms. Currently the Initiative for Sustainable Agriculture has partnered with Heaven Ministries to provide fresh produce to be donated to their food drive and cooking classes, supporting the Queen Anne’s County Region.